Down by Crow Creek, at the edge of a small clearing all set about with wild sweet Williams, the snag of a dead tree is getting lively. 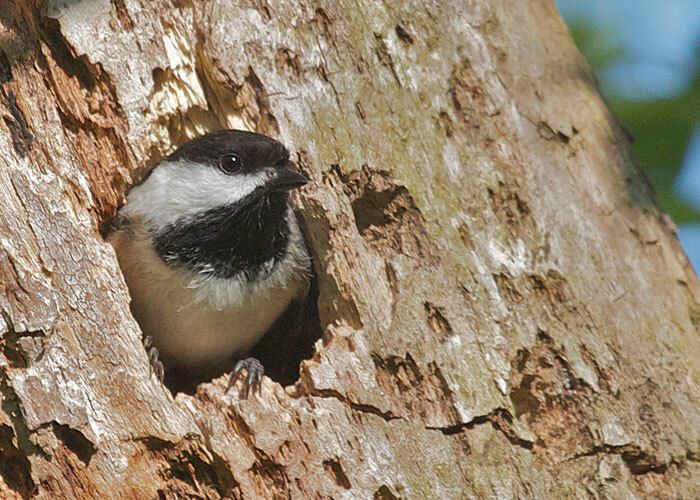 The chickadee eggs have hatched, down inside of the trunk, and the parents are bringing tiny insects to the babies. Here Mom or Pop leaves the nest for another load of groceries. This is the first photo I have gotten from inside my wonderful blind. Oh what the heck! Birds are so gorgeous and precious to experience, just go and get yourself a pair of really high quality binoculars. So that you can appreciate the beauty of the birds. If you don't have good optics, you have no idea what you're missing! It's a high-quality binocular, one that bears comparison to the highest-priced binoculars in the world. Yet its price is in reach for serious (but still budget-minded) birders. 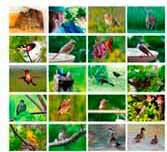 If you happen to have a Mac, you can use Bird Brain, a birding database for Macintosh computers. It keeps your life list, backyard list, yard list, and more. And your notes and photos, too.